They say that practice makes you perfect, and anyone hoping to get better at golfing will need to get a lot of hours of practice under their belt. When you can’t go to the golf course to practice your swings, though, then you may need to make do with a substitute. Practicing at home or at an indoor facility means you will be limited for space, which is why practice golf balls are considered the best alternative to conventional golf balls. There are lots of different brands and types of practice golf balls, and finding the best practice golf balls can be a challenge, but it is one you can manage if you read on to see our tips for shopping for this particular piece of golfing equipment. Practice balls are typically made from either foam or plastic, which allows them to only travel short distances. They are light and not meant to go very high or very far, making them easy to recover and ensuring that they don’t cause damage in confined spaces. 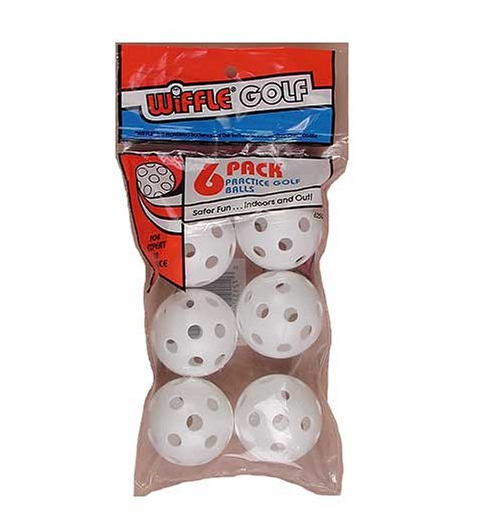 They are similar to wiffle balls in how light they are, so you can imagine they aren’t what you would be using to hit long drives across an open golf course. For indoor practice, however, these balls are superb. They give you the opportunity to hit multiple balls in a short amount of time, and a good practice ball will hold up to repeated swings. Practice balls are also a cheap alternative to regular golf balls. They are made of much less expensive materials, so if you lose a few, it’s no big deal. When you don’t have much space to work with and you are more interested in working on our swing than seeing if you can hit a ball true, practice golf balls can be a blessing. They are used by industry veterans and golf pros as a way to train their swing in a quick and effective way. If you use practice balls in conjunction with a training tool, such as a golf swing analyzer, you can see some improvement over time. You’ll be able to pick out your swing and stance problems and make a huge impact on the way you play the game. With conventional golf balls, you might be more concerned with where the ball is going and if it will do any damage indoors as you practice, so using soft, light practice balls is often the best way to go. We have shown you what you should be looking for when you buy the best practice golf balls, and now we want to give you a few examples of the best practice balls available today. These are great approximations of traditional golf balls. 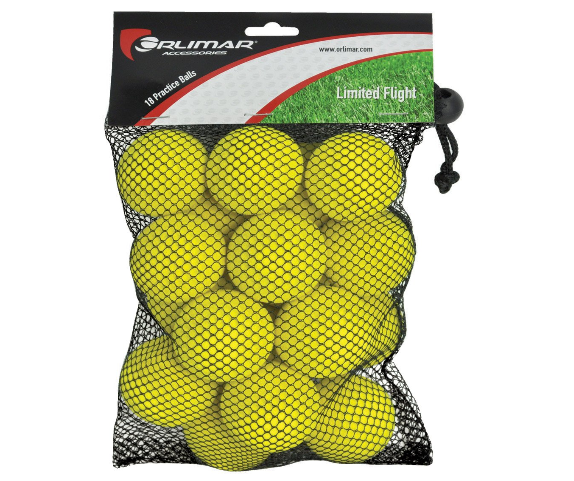 They are lighter than your average golf ball, which makes them ideal for hitting in smaller, enclosed spaces. They are heavier than most practice balls, though, but soft enough that they should not cause much damage if they hit something. 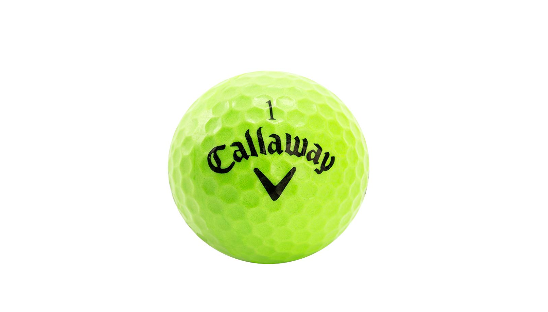 Callaway has made very durable golf balls that will cost you more than your average practice ball, but that will also last much longer. Plays similar to a real golf ball. Costs a bit more than most practice balls. These are tough and heavy practice balls as well, similar to regular golf balls. They have some great stability and elasticity, and they are designed to be so soft that they do not damage your property. These Airflow balls are made with tough foam and should last you for a long time. The bright colors make them easy to recover and see when mixed among other player’s balls. Because these are a bit heavier and tougher than your normal practice ball, they do cost more. Expect to pay a bit more for these. You could just go with these straight up wiffle balls. These are very light and airy and hollow on the inside. They aren’t going to fly very far or move very fast, but they do give you something to hit. Since they are not that solid, you won’t get the same contact experience as you would with a golf ball or even a tough, foam ball. However, the price is great, and you get a lot of value from them. They are reasonably durable for what they are, but don’t expect these wiffle balls to last more than a few months with regular play. The price is very low. Lots of balls in one package. Not made to last very long. Does not mimic regular ball flight. Here is another example of tons of value for your money. You don’t have to pay a lot to get some decent quality hard practice balls. You can buy these in packs of more than 40 for less than $15 at most retailers. 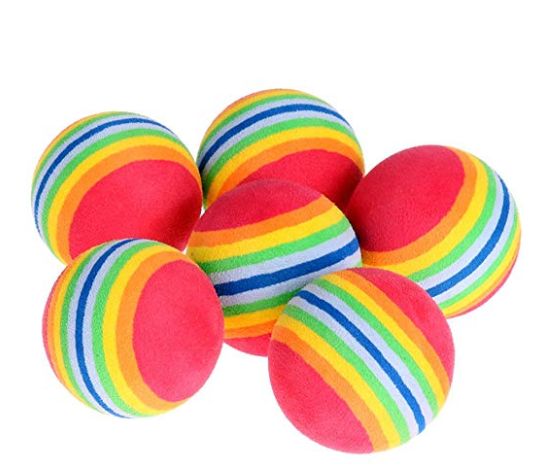 These are brightly colored balls that travel similarly to a normal golf ball, but they are not quite as heavy. They are designed to be light and soft, yet heavy and tough enough to fly fairly far and last you for a while. They are not as tough and durable as the other choices on this list, but at that price, they don’t need to be. You are still getting some great value for your money. Flies similarly to how normal golf balls do. Tons of value at the price you pay. Not as tough as the competition. With these practice balls, you get some decent distance and weight behind them, yet once again, they are designed to be soft enough that they don’t cause any serious damage to whatever they end up hitting. Orlimar has made these with high density foam and made them lightweight to prevent them from going too far or causing severe damage. For well under $20, you can get a pack of 18 of these practice balls. Not too hard to cause real damage. Offers some good distance and height. Lighter than other foam balls on this list, meaning they won’t fly as true. Because there are so many golf practice balls, you have to be careful that you don’t pick the wrong one. You want to feel confident about your decision and not hurt your training efforts. Material– There are two main types of practice golf balls- foam and plastic. The plastic kind tend to deform more easily, says livestrong.com. Foam balls tend to be more expensive, but with both, there is the quality issue to consider as well, which can determine how tough the balls are and how much they cost. Quality– A good quality ball will be sound investment, and you need to consider how much you are spending on practice balls. The costs can quickly add up if you practice often and have to replace balls regularly or if you lose them because of where you are practicing. At times, the quality of the ball may be less important as you try to save money. There are instances where you will want a cheaper quality ball and instances where a better quality one will serve you well, and you need to figure out what your preferences are as far as the quality of the balls. 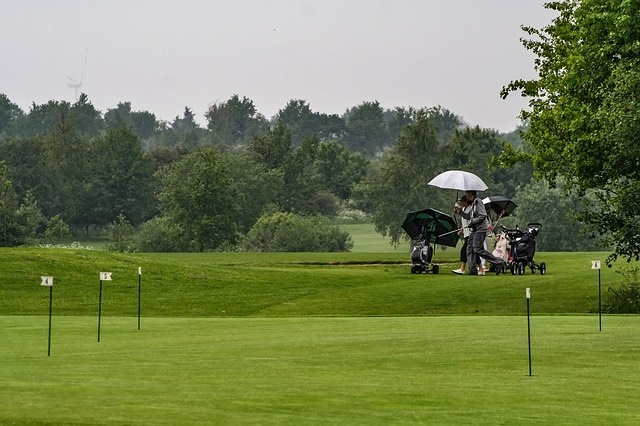 Flight– Most people don’t buy practice balls for their ability to fly straight, but there will be times where you want to practice with a cheap ball and get a decent feel for how your swing would affect a real golf ball. The way a practice golf ball mimics a traditional golf ball can be important to some players, but it will usually only matter if you have a wide open area in which to practice. 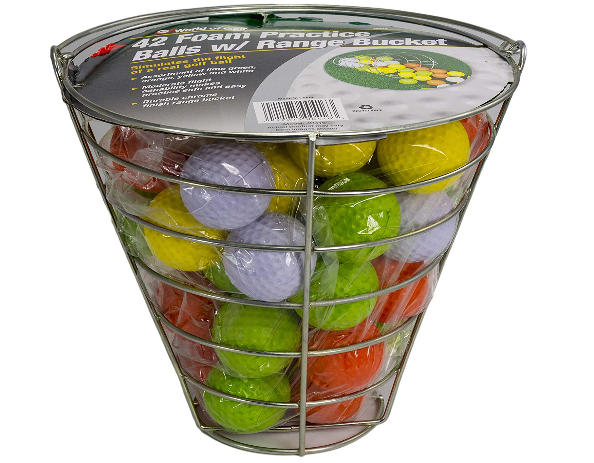 If you are playing indoors in a small, confined area, then you won’t need to worry about how well the practice ball manages to imitate a real golf ball. Hybrid Balls– You don’t have to go fully foam or hollow plastic with your practice balls. golfballs.com suggests that you try out hybrid balls that have soft foam on the outside and hard polyurethane underneath. These travel a lot like a normal golf ball, but the soft cushioning on the outside keeps them from damaging things as easily as your typical golf balls would. That makes them perfect for hitting indoors or in other confined spaces. Buying Overly Cheap Balls– Look, practice balls are not meant to be expensive, but if yours deform quickly and fall apart after a few hits, then you are wasting your money. You are not getting good value from your purchases, and you should be careful about how cheap you go with practice balls. Paying for Name Brands– While you could go too cheap with practice balls, you could also easily go too expensive with them. It’s not necessary to buy name brand practice balls, because these are not balls that you will be using for your actual golf game. They are meant to be light and disposable, and those are not qualities that should cost you very much. 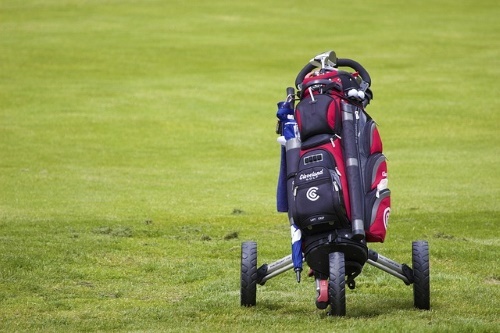 Falling for False Promises– With golf practice balls, you are not getting a replica of a golf ball. You will get some similarities, but these are going to fly differently and have a different weight to them. Don’t be fooled by marketing hyperbole and false advertising that claims hitting them is just like hitting the real deal. Live Healthy warns about expecting practice balls to make contact with your club in the same way as conventional balls. And once you realize that difference, you will have the right expectations. 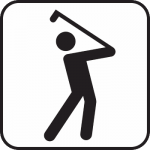 Swinging Differently– Once you start using practice golf balls, you will have to learn how to hit them just like you hit regular golf balls. They will impact in a different manner, but you won’t be able to fix your swing problems if you are trying to hit them differently than you hit normal golf balls. If you have never used practice golf balls before or you are unsure of how to buy a set of these, just follow the guidelines we have listed above and you should be set. We hope this guide enables you to shop for the best practice golf balls with confidence and buy ones that will work very well for you.